Five thousand years ago, when sea level was about 20 feet lower than today, there was no Biscayne Bay. Biscayne Bay formed as sea level rose to fill a depression in the limestone between 5,000 and 2,400 years ago. During and since that time sandy barrier islands, banks of carbonate sand and mud, and coastal wetland swamp and marsh deposits have grown and evolved to give the bay its present form. Especially critical was the relatively slow rise in sea level that occurred during the past 2,400 years (less than 2 inches of increase in sea level per century). During that time, shallow sand and mud banks formed along the eastern margin of central Biscayne Bay and extended well across northern (north of present Julia Tuttle Causeway), southcentral (Featherbed Banks), and southern Biscayne Bay, partitioning the bay into natural divisions. Natural, unaltered Biscayne Bay was a magnificent shallow subtropical estuary characterized by clear water and dominated by diverse and productive bottom communities of seagrasses and hard bottom soft corals and sponges. Mangrove wetlands rimmed the bay margin with limestone reaching the coast in only a few places. The bay was once noted for freshwater springs that were visited by ships to get drinking water. The clear waters were maintained by the sediment filtering and trapping activity of the bottom (or “benthic”) communities of plants and animals and by coastal swamps. 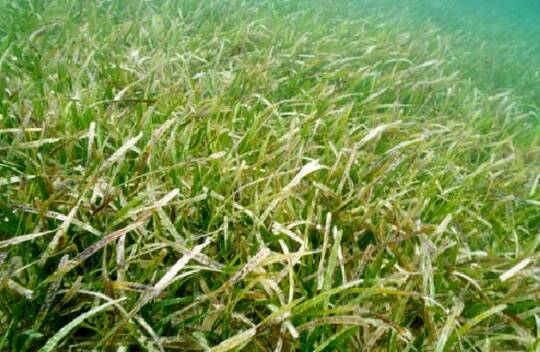 The benthic communities, in turn, were able to flourish because of the clear waters. Landward, freshwater sheet flow, natural tributaries, and shallow depressions that cut through the coastal ridge (known as transverse glades), fed water from the Everglades to the margins of the bay. Freshwater even entered the bay through springs in the limestone. Salinity channels and resulting freshwater upwelling affected the bay from the coastal cliffs to likely far offshore. The seaward margin of the bay was a series of sandy barrier islands to the north, channel-dissected shallow marine sand and mud banks along the central portion, and islands of an emergent coral limestone ridge to the south. The entire south Florida coastal ocean ecosystem, including Biscayne Bay, has undergone major environmental change due to a century of extensive regional population growth that accelerated coastal and watershed development, pollution, and habitat loss and degradation. Miami began to grow at the beginning of the twentieth century, and Biscayne Bay became the site of one of its most important population centers. By 1917, four canals dissected the Everglades from Lake Okeechobee to the Atlantic Ocean, including the channelization of the Miami River. 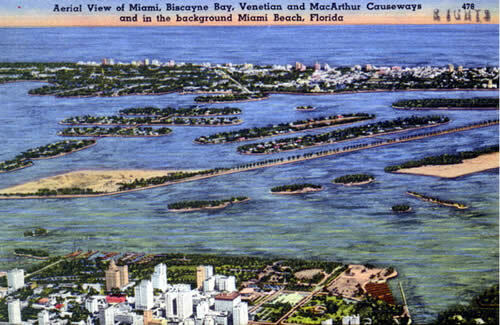 Later, Baker’s Haulover was constructed and other ocean inlets across Biscayne Bay barrier islands were stabilized. Alterations continued throughout this period, culminating with significant changes that resulted from the Central and Southern Florida Project for Flood Control and Other Purposes, which began in 1948. This project dramatically lowered freshwater levels in the Biscayne Aquifer by approximately four feet by cutting drainage canals to drain surface and groundwater to prevent intermittent coastal flooding and expand agricultural production. As a result of a century of modifications to hydrology, Biscayne Bay has changed from a subtropical estuary fed by coastal rivers, tidal creeks, and groundwater seepage, including submarine springs, to a pulsed system that alternates between marine conditions and extreme low salinity conditions near canal discharge sites. Freshwater now enters the bay as an intense point source rather than as distributed input over time and space. Today, Biscayne Bay is an estuarine lagoon with salinity, circulation, and water quality that varies and is dependent on freshwater flow, wind driven circulation, and ocean exchange. The bay can be viewed as three distinct areas—each differs depending on local effects on hydrodynamics. The following page describes each of these areas.